Overkill is a character that was first introduced in the Generation 1 cartoon continuity in a single Season 3 episode. And� that�s it. There are a few appearances here and there in other media, but nothing worth mentioning. 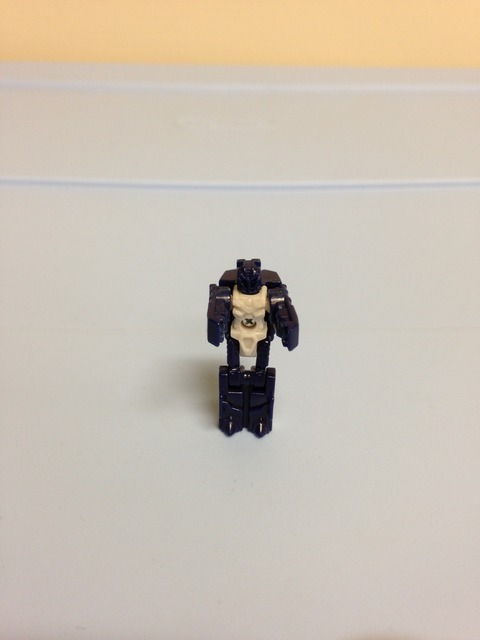 The original figure was released in a 1987 two-pack with Slugfest, two cassettes intended for use with Soundwave. There was also a Universe Special Edition version in 2008 that was a repaint of Classics Grimlock. Having a repaint (of Crashbash) for Overkill is a decent idea, seeing as the mold itself actually fits Overkill much better than Crashbash Squeezeplay ever did. 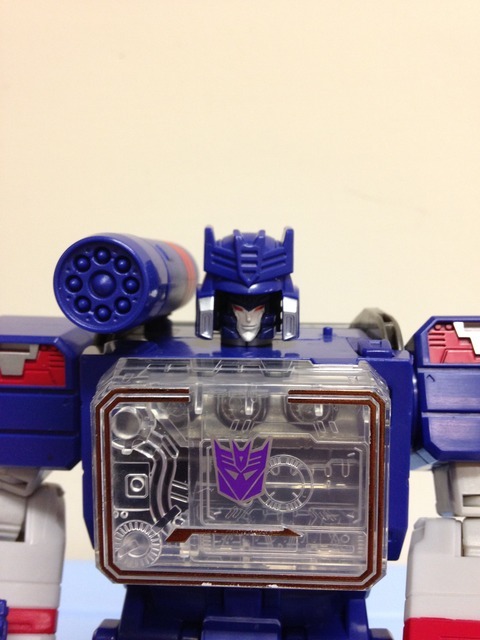 Add in that we�ve gotten a brand new Soundwave in the Titans Return line, and this seems to make sense. The T-Rex mode is where Overkill is the best. He�s a tiny little dude, but the whole thing works really well. The colors are quite close to the original toy: off-white and navy blue. 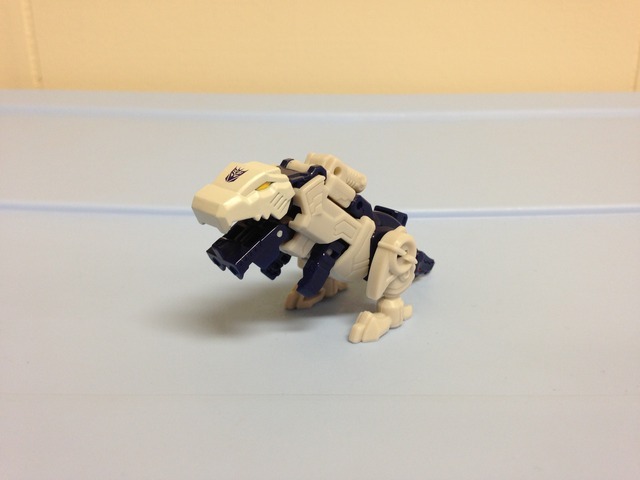 You�ll also find some yellow eyes and a navy Decepticon symbol on his T-Rex head. There�s a good mix going on here, and I like how his arms are integrated into the T-Rex � most Titan Masters are just folded up and hidden in their respective modes. The way the T-Rex is designed allows for the mouth to open and close a bit since the lower jaw is simply the little robot�s legs and there�s a joint there. It�s a nice design and done very well. These figures are really simple so I will spare you the transformation sequence. Anyways, while this mode is included, I don�t care for it at all. The �wings� are just the undersides of the T-Rex belly, and the �tail� is the T-Rex head. The Titan Master can ride on this� uh, chicken� er, space dragon, while holding onto the aforementioned wings. The whole thing isn�t really balanced that well either. I like to pretend this mode doesn�t exist. The gun mode isn�t terrible, and it works well with other Titans Return figures. You can use it as is, or you can have the Titan Master man the gun if you like. The major detraction here is that the gun barrels are just the chicken/dragon feet, and the T-Rex head is just hanging out back there. While this mode �functions�, it�s quite heavy on the �meh� scale. 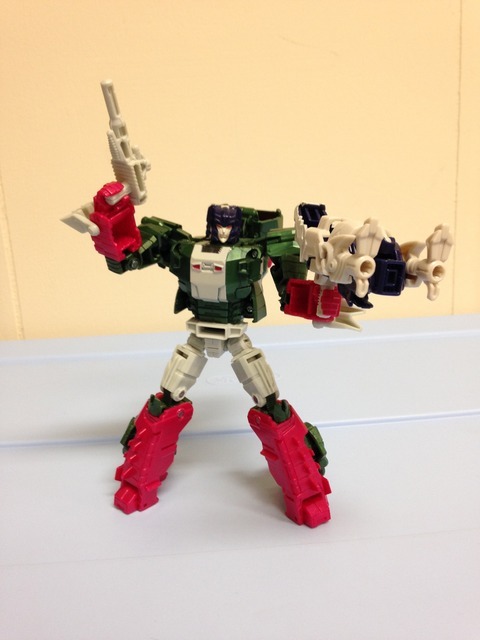 Overkill�s robot mode is pretty bland, which seems to be a continuous theme with these guys. The body is off-white, while the head, arms, and legs are all navy blue. Sadly, the face isn�t painted silver like Crashbash�s was. That little dab of paint would have significantly improved this figure. That didn�t happen. Overkill�s head mode is very well detailed, the same as it was for Crashbash. The outer �helmet� is navy blue, while the face is painted in off-white with red eyes. The whole look is crisp and well detailed, and works with a wide range of Decepticons in the Titans Return line. As is the case with all of these figures, the head plug will work better with some than others � it�s more of a trial and error thing. One thing of note, however, is that I purchased Overkill for use with Soundwave. On paper, that�s a good idea being that Overkill used to be a cassette. However, due to Soundwave�s helmet design, using Overkill will result in Soundwave having two helmets and one really tiny face. What a bummer. Transformation Design: 5/10. Simple. It�s a Titan Master. Integrating the robot arms into the T-Rex is a nice design choice. Durability: 9/10. Everything is solid and good quality. He�s so small and light I don�t think things are going to break. Fun: 8/10. The T-Rex mode is pretty sweet, and the gun mode, while goofy, isn�t terrible. The killer head mode works pretty well too. Aesthetics: 8/10. He�s tiny and I display him as his T-Rex on a shelf. From that aspect he is great. Articulation: 5/10. Average I suppose? He�s got joints where he needs them for a Titan Master. Value/Price: 7/10. This is probably one of the more fun Titan Masters for the measly cost of $5 USD. Overall: 7/10. Overkill does what he needs to do an adds some additional fun features to your Titans Return collection. 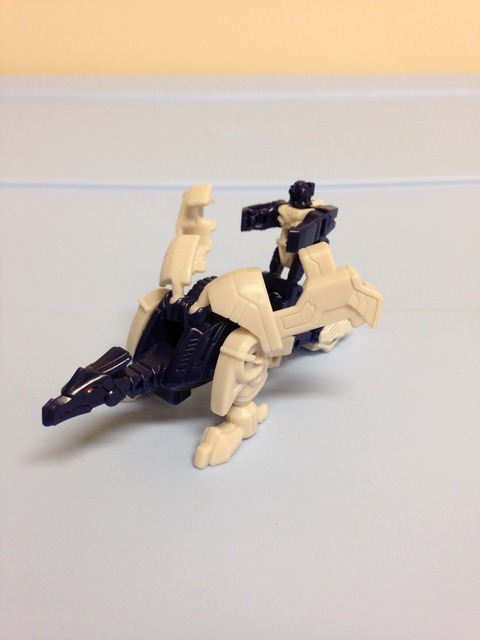 The T-Rex mode is great, and he�s a fair representation of an old cassette. For a cheap figure, he�s worthy of an impulse buy for sure.